MR. COUGHLAN: On the 2nd June 1995, a meeting took place in Brussels between departmental officials and officials of DG IV of the Commission. The departmental officials pointed out to the Commission that the fee was not the main driver of the GSM competition; that the competition was a beauty contest and not an auctioning process. The fee is listed at No. 4 of a set of eight criteria. The model being used to evaluate the bids was explained to the Commission officials, and it was also pointed out by the departmental officials the important elements of asymmetrical regulation in favour of the new GSM operator. A summary note of the meeting with the officials on the 2nd June, 1995 records that “Those in attendance were Mr. Martin Brennan, Principal Officer; Mr. Sean McMahon, Principal Officer; Mr. E. Molloy, Assistant Principal; Mr. Jimmy McMeel, Assistant Principal Department of Finance; Mr. M. Andersen, Andersen Management AS Consultants; and Mr. Herbert Ungerer, of DG IV of the Commission. – The Department want to come to an understanding with the Commission side quickly. – Formal proceedings are commencing in the case of Italy; this is also likely to be instituted soon in the case of Belgium and Spain. “The Commission accept that the fee could be compensated by concessions given to the new entrant, (e.g. infrastructure rights, national roaming rights on the incumbent’s network or possibly concession on the interconnection fee) but this is a second best and has not been tested legally. The imposition of uncommercial burden, e.g. excess staffing on the incumbent, could also be seen as an offset on the fee charged to the new licencee. The best solution is to have a fee purely covering administrative expenses. “If the fee is greater than this, DG IV is obliged to follow it up. In the process which will follow, Ireland will be treated on a basis which is equal to other Member States. “Any defence of the fee by Ireland must describe the position of the fee in the evaluation process. The size of the final fee applied will also be relevant. “The next step for Ireland should be to reply to the commissioner’s letter. “The Commissioner is prepared to meet the Minister if so required. On the 2nd June, 1995, a Joint Venture Agreement between Communicorp Group Limited and Telenor Invest AS was entered into. This agreement provided at clause 2, under the heading “Financial Guarantee” “Within June 16th 1995 Communicorp shall provide Telenor with a financial guarantee satisfactory to Telenor (the guarantee). The guarantee shall amount to IR£5 million plus 50% of the licence fee. “The submission of the bid is subject to both Telenor AS and Communicorp’s board approval. . It would appear that this guarantee was never provided. However, other provisions of the joint venture agreement were implemented and the failure to provide the guarantee does not appear to have affected the operation of the joint venture agreement. The eighth meeting of the GSM Project Group took place on the 9th of June, 1995. This concerned the evaluation model. Present at this meeting were Mr. Martin Brennan, Mr. Fintan Towey, Mr. Eamonn Molloy, Ms. Maev Nic Lochlainn, Mr. Sean McMahon, Mr. Eugene Dillon, Mr. Denis O’Connor, Mr. Donal Buggy, Mr. Jimmy McMeel, Mr. Billy O’Riordan, Mr. Aidan Ryan, Mr. John McQuaid, Mr. Michael Andersen, Jon Bruel. The meeting records, contact with the Attorney General’s office and the advice that had been received as regards the question of a Commission challenge. And it was recorded that Denis McFadden had advised that if the Commission challenged successfully re the fee, any applicant could then challenge the whole competition process, as they could have made their bids on the basis of the fee being one of the key criteria. Under the heading “Contacts with the Commission re the GSM competition process”. And that was the document which I just opened. “The collective view of the delegation was that while the GSM fee issue would be challenged on a formal basis by the Commission, it could be resolved by the provision of adequate assurances in writing re mitigating factors, etc. “Prior to the meeting, the Department of Finance had been asked to clarify their final position as regards the licence fee, in light of the group’s new awareness of the certainty of a Commission challenge with its attendant legal and financial implications. “Four options were identified in relation to the fee. – D. Impose equivalent fee on Eircell after the competition is over. “It was agreed that Options B and D would be politically unacceptable. With regard to Option A, the Department of Finance was of the view that the legal advice of a senior counsel should be sought at short notice before any change could be contemplated. .
“In the event that the legal advice recommended against Option A, it was agreed that a fixed fee of £10 million for Eircell and a cap of £15 million on bids to become the second operator might be an acceptable basis on which to proceed, subject to the agreement of the Commission and the Department of Finance. – 5. In the event the parameters of competition were changed and the closing date for the competition basis of the original competition requirements. – On the other hand, if the legal advice indicated substantial risks in proceeding with the competition, particularly the licence fee element would have to be amended. Approval of the Minister for Finance and for Transport, Energy and Communications, of the Taoiseach and the Tanaiste and the Minister for Social Welfare would be required (the legal advice would be help here.) Once approval among those Cabinet members was assured, there would be no need for more than a mention at Government. Turning to the final page of the note, other matters were discussed which do not appear, at this stage, to be significant. Having obtained the advice of senior counsel, it would appear that the view was confirmed that a once-off licence fee could be challenged by the Commission. If challenged, there was grave concern that the challenge would be successful. I am now turning once again to events concerning one of the applicants. There exists a draft engagement letter dated 14th June, 1995, from Credit Suisse First Boston addressed to Communicorp Group Limited confirming the terms and conditions of the engagement of Credit Suisse First Boston Corporation by Communicorp Group Limited to act as exclusive placement agent and financial adviser in connection with the private placement by the company of up to $80 million of convertible preferential stock and/or subordinated debt. This draft engagement letter was furnished by fax to Mr. Owen O’Connell of Messrs. William Fry Solicitors by Mr. Peter O’Donoghue for the purpose of review on the 22nd June, 1995. – What action could be taken by the Department, bearing in mind the political imperative of generating Exchequer revenue through the GSM competition which would enable the DG IV to indicate definitely that such action would not be taken (for example, a change in the fee requirement to a fee capped at £15 million for the second operator and the imposition of £10 million on Eircell). “2. Mr. Ungerer indicated that the Commission’s legal service are of the view that based on existing case law, there is a strong legal case against large GSM licence fees. The European Court interprets the competition rules widely, and the fact that a GSM licence fee distorts trade between Member States can therefore be established without difficulty. For example, the effect of a fee is to stunt market development, thereby curtailing demand for handsets and equipment which are internationally traded. Similarly, it has an effect on the level of international roaming. “Mr. Ungerer strongly counselled against the Commission’s arguments being opposed, on the ground that a GSM licence fee would not distort trade between Member States and that the competition rules do not therefore apply. “3. Given the political imperative that Exchequer revenue be generated from the GSM process, Mr. Ungerer recommended that the Department write to the Commission outlining the factors which provide a justification for the imposition of a fee on the second operator; i.e. factors which reduce costs or confer other financial benefits which mitigate the negative impact of the fee on the second operator. This could include infrastructure rights, co-location, national roaming concessions, a beneficial interconnection deal, tax deductibility of the fee, the relevance of the fee in the selection process, etc. He envisaged a definitive Commission view on the acceptability of the overall package within a period of four weeks of the letter. The Commission representatives accepted that this would necessitate deferment of the closing date for the submission of GSM applications, and while it was recognised that this was not desirable, they seemed less concerned than the Department by the implications of delaying the process. The Commission are negotiating similarly with a number of Member States. “4. With regard to a possible capping of the fee payable by the second operator, the Commission would be interested in looking at the possibility, having regard to the ratio between the level of the cap and the overall investment required by the project. Any adjustment which would have an effect of reducing the financial burden on the new entrant would be welcomed. The possibility of such a capping arrangement being put in place in conjunction with the imposition of a fee of a broadly similar magnitude on Eircell was very favourably received by the Commission, although it was mentioned that the effect of a fee payment by a company to its shareholders could be open to question. On the 16th June, 1995, by way of press release, the Minister, Mr. Michael Lowry “announced today that the closing date for the application to become the second operator of GSM mobile telephony within Ireland has been deferred. Applications to become the single competitor for Telecom Eireann’s Eircell were due on the 23 June, 1995. “The Minister explained that certain aspects of the terms of the competition required further consultation with the European Commission. He acknowledged that the primary difficulty relates to the role of licence fees in the selection process. It was anticipated that the consultations would have been completed before the closing date, but this had not proved possible. “I refer to the competition process to select a licencee to become the second operator of GSM mobile telephony in Ireland. “The Department has been in discussion with the European Commission in relation to certain aspects of the tender document. While it had been anticipated that these discussions would have been completed prior to the closing date for the submission of tenders for the GSM licence, it has now become apparent that this is not feasible. Consequently, it has become necessary to extend the closing date. “1. Mr. Brennan and Mr. F. Towey met with Mr. Denis O’Brien and Mr. Ed Kelly, Esat Telecommunications, on the 19th June 1995. Esat had requested the meeting to discuss the recent postponement of the GSM competition. – No indication could be given of any revision which might be put in place in relation to the licence fee. Potential applicants must, pending further clarification, draw their own conclusions from the Minister’s statement as reported in the media. – The possibility of new applicants entering the process, although probably unlikely at this point, was not precluded. A Ms. Helen Stroud of the solicitors firm Baker & McKenzie Solicitors, who were the solicitors for Advent International, sent a fax to Mr. Owen O’Connell of William Fry Solicitors and attached a revised marked up draft of the agreement which was signed by Advent International, Communicorp Group Limited and Denis O’Brien on the 12th July, 1995. “1. Recital B, I have made the amendment, but perhaps you could let me know in broad terms the issues raised by the European Commission and the effect it will have on the time scale. On the 19th June, 1995, Mr. Paul Connolly sent a memorandum to Mr. Denis O’Brien and Mr. Peter O’Donoghue with his comments on the Credit Suisse First Boston draft engagement letter of the 14th June, 1995. On the 20th June, 1995, a meeting took place between Mr. Martin Brennan and Mr. Fintan Towey on behalf of the Department, and a Mr. J. Condon, consultant to Persona consortium. The purpose of the meeting was to discuss the recent postponement of the GSM competition. Once again, appropriately, a note was kept of the meeting, which was attended by two officials of the Department. “1. Mr. M. Brennan and Mr. F. Towey met with Mr. J. Condon, consultant to Persona consortium, on the 20th June 1995. The purpose of the meeting was to discuss the recent postponement of the GSM competition. “2. The Department clarified that the consultation process with the Commission in relation to the licence fee may take four weeks to complete. The closing date for the competition will be a further three to four weeks. “3. Mr. Condon indicated that it was rumoured in the market that Vodafone had complained to the Commission complaining about the interconnection arrangements. Mr. Brennan clarified that the Department had no reason to believe the Commission was acting on a complaint from any party. The Department was aware of and regretted Vodafone’s decision to withdraw from the process. “4. Mr. Condon felt that three weeks would be sufficient for submission of revised applications after agreement is reached with the Commission. The Persona consortium is already engaged in the revision process based on media speculation about the new fee requirement. “5. The Department clarified that new applicants for the GSM licence would not be precluded from joining the competition at this stage. On the 20th June, 1995, Mr. Martin Brennan wrote to Mr. C. Hocepied of the Commission enclosing a draft to the Commissioner, and he made further comments on the licence fee issue. “Thank you for your fax message today concerning the agreement we are seeking to reach on the competition process for the Irish GSM licence. A copy of the draft letter which it is proposed that the Minister issue to your Commissioner within the next day or so is enclosed. – Having regard to the revised fee proposal (15/10), the fee element will probably now have a weighting of 10 percent or less in the quantitative analysis of applications. – Eircell will be required to pay a fee related to but less than the new operator. A difference of £5 million can be justified by administrative costs related to the GSM competition design and selection process. – The points made in relation to infrastructure and interconnection are fully and factually correct. – With regard to co-location, the new operator will have a right to equivalent treatment by Eircell, by Telecom Eireann in all respects including co-location subject only to technical constraints. – The second GSM operator will have an entitlement to seek to negotiate national roaming with Eircell but without compulsion on either side. – Direct international interconnection will not be allowed, for the reasons stated in the enclosed draft letter. – It should be noted that the second operator will have a right to a DCS 1800 licence when this technology is licensed in the Irish market. – The second operator will also have the right to become a reseller or service provider on Eircell’s analogue service to prevent this service being used in an anti-competitive way. “With regard to the legal basis for the grant of the licence, I can confirm that Section 111(1) of the Postal and Telecommunications Services Act 1983 relates to the licensing of services within the exclusive privilege of Telecom Eireann. However, this provision was drafted specifically for the purpose of providing for the introduction of competition in services which, at the time of the passing of the Act, were provided on a monopoly basis by Telecom Eireann. Once a licence is granted, Section 111(1) does not limit in any practical way the operation of the licence, nor does it preclude the grant of a further licence. “1. The Commission has objected primarily to the auction concept inherent in the proposals for the grant of the second GSM licence. Accordingly, the terms of the application are to be revised, with either no up-front payment required or a maximum cap placed thereon. It is expected that the timetable will be extended by about two months”. For the moment, the rest of the letter is not relevant. The Tribunal wished to know from whom and when he had received instructions which enabled him to make these statements. The Tribunal also wished to obtain details of his knowledge, direct or indirect, as to the source or sources of the information comprised in his instructions. The Tribunal made these inquiries bearing in mind that the process was supposed to be a sealed process and confidentiality procedures had been agreed upon and put in place in the Department, had been notified to the Minister, and according to the Secretary of the Department, had been understood and accepted by the Minister. Before I deal with what Mr. O’Connell informed the 26 to the approach to revision with either no up-front payment required or a maximum cap placed thereon appears to reflect the discussion at the GSM Project Group of the 9th June, 1995. Mr. O’Connell informed the Tribunal in the first instance that he had no direct recollection either of the person from whom or the date upon which he received the instructions referred to by the Tribunal, nor the source or sources of the information comprised in his instructions. He informed the Tribunal that he was undertaking a review of his files to ascertain whether they contained any correspondence or notes which might throw some light on the matter. Having considered his files, Mr. O’Connell has informed the Tribunal that no written record has been located, either of his receipt of instructions in regard to the statements referred to by the Tribunal or which assisted in recalling the source of the information comprised in his instructions. This is a matter which the Tribunal will inquire into for the purpose of considering whether the integrity of the second GSM licensing process was compromised or undermined. On the 21st June 1995, Baker McKenzie sent a first draft of a loan agreement to RINV, to Denis O’Brien and Peter O’Donoghue. That was the loan agreement to which I have already made reference and related to the provision of funds to Communicorp at a premium of 30 percent. On the 21st June, 1995, there was a fax from Baker McKenzie to Mr. Owen O’Connell enclosing a revised draft agreement and indicating that Advent had always understood that the comfort letter would be issued to Telenor, but assumed that the drafts sent through on the previous Friday would have been shown to and approved by them. The fax indicated that if this was not the case, a request was to be made to Frys to let Baker McKenzie know what form of comfort letter was being looked for and to amend the draft accordingly. On the 21st June, 1995, the Minister, Michael Lowry, answered Dail questions, and in particular he replied to a question asking the Minister for Transport, Energy and Communications if the EU Commission had sought to prevent in any way the Government from seeking an estimated £45 million for the award of the second mobile phone licence. “I am currently in consultation with the Commission regarding certain aspects of the GSM competition, and in particular the requirement that applicants indicate the level of fee they are prepared to pay for the licence. The Commission is concerned that this requirement may be contrary to the competition rules of the EU treaties. It had been anticipated that these discussions would have been completed before the planned closing date of the 23rd June 1995 for receipt of applications for the GSM licence. Unfortunately, it became apparent over the last week that this would not be feasible. Consequently, I informed all prospective applicants that the closing date would be extended. “My priority now is to get the competition back on track as a matter of urgency. Consultations with the Commission could take up to a further four weeks to complete. My aim is to achieve as much legal certainty as possible before announcing a new closing date. While prospective applicants will be allowed an appropriate period to adapt their applications if necessary, the new deadline for receipt of applications will be set as early as practically possible, and I am confident that the successful applicant will be selected before the end of the year. Then on the 22nd June, 1995, the Minister formally wrote to Commissioner van Miert in response to his letter of the 27th April. A draft of this letter had already been furnished to the Commission by Martin Brennan on the 20th June, 1995. I should perhaps state here, Sir, that there is nothing untoward about drafts being furnished prior to the final letter being sent. This enables officials to deal with certain drafting aspects of documents before they are furnished in final form. The letter is addressed to Commissioner Karel van Miert, Commissioner of the European Community. “Thank you for your letter of the 27 of April 1995 on the subject of the competition process for the award of a licence to a second operator of GSM mobile telephony within Ireland. “I would like to elaborate on the basis for, and motivation behind, the structure of the competition. “As noted, there is a “once-off initial licence fee” of not less than £5 million payable by applicants. Applicants are invited to offer a higher fee with their licence application if they wish. This provision balances a number of elements, all material to a free and fair competition, taking into account the interests of those who will be applying for the new licence, the interests of the current GSM operator, Eircell Limited, and other material interests. “It is important to understand that the new operator will have a right of full infrastructural freedom, including access to the existing infrastructure owned by third parties. (See paragraph 15 of the competition document and clarification in the subsequent information memorandum at page 9). This is a major concession and major advantage to the prospective new licencee in its start-up phase. It also confers a fundamentally important potential head-start advantage when the voice telephony market is liberalised. Further, it is also to be noted that the licencee is offered a right to a DCS 1800 licence in due course. “In addition to the above, the successful licencee will also have the right to become a reseller or service provider on Eircell’s analogue service in order to prevent this service being used in an anti-competitive way. I believe this to be innovative and extremely attractive to the prospective licensees, who will be concerned to see an even playing field from the competitive point of view. “The prospective licencee is also being given the right to equivalent treatment by Telecom Eireann compared with Eircell in all respects. This includes a right to co-location where technically feasible. “The new operator also will have the possibility of negotiating a commercial arrangement with Eircell for national roaming. “Above I have listed some of the essential and innovative advantages that will be available to the new licencee. However, to maintain fairness in the marketplace, I have also had to consider the rights of the existing GSM service provider. In particular, my mind has been exercised by the need to ensure that the new service provider pays an appropriate price to ensure that the new service provider’s entry to the market at its current state of development and in circumstances where he will be obtaining the benefits enumerated does not provide to the new operator a form of disguised commercial aid which is not available to the current operator, who has had to engage in ground-breaking work and a level of investment which will not be incurred by those who follow it into the established market. “The solution to this problem has called for a balancing of interests. My primary concern is to see open competition between providers of GSM services to the advantage of the consumer. The “once-off licence fee” could have been computed on the basis of charging a fee which levied from the new entrant the real cost of the advantage they will obtain by entering the GSM market at this point in time. However, I have been forced to concede that the level of such a charge might act as an inappropriate barrier to entry into the market, leading to less competition. On the other hand, in the interests of fairness and open competition, I have had to gauge what would be an appropriate once-off licence fee to charge for the benefits I have outlined. I believe the solution achieved is innovative. It is proposed to charge a minimum once-off licence fee of £5 million. However, it is reasonably clear that persons who wish to be licensed will be prepared to pay in excess of this sum because they recognise the advantages that will come to them by entering the market at this stage of development and on the basis of the advantages they will receive, some of which are enumerated above. “On the basis that prospective licensees will be best available to value, in commercial terms, what is a reasonable price to pay for these advantages, I have given prospective licensees the opportunity to pay a larger once-off licence fee if they consider this is appropriate. However, in order to avoid the possibility that financial might will win over innovation and technological expertise to the detriment of the end consumer, I have not made the amount of the licence fee that any prospective licencee will offer a definitive selection criterion. Rather it is one of the criteria that will be used. It is in fact ranked only fourth of eight criteria in descending order of priority. A clear but confidential decision has also been taken that this element will get less than 15 percent of the overall marks in the quantitative assessment by our consultants. “Despite the considerable arguments adduced in the foregoing, on the basis of your letter and in the interests of ensuring that there is an openness and transparency which will ensure that nobody can ever be seen to complain that Eircell are being favoured, I am prepared to impose on Eircell the requirement to pay a once-off licence fee payment to coincide with the licensing of the second operator. I do this in recognition of the fact that some of the costs which have been incurred in starting up the GSM network have not necessarily been incurred by Eircell but rather by other third parties. Having reviewed the matter carefully, I believe imposing a once-off licence fee on Eircell in the sum of £10 million tied to a cap on the amount any prospective licencee can offer of, say, £15 million guarantees, in concrete terms, that my desire not to penalise Eircell and at the same time charge a fair “once-off entry fee” to the new provider will be seen to be clearly fair and appropriate, proportionate to all parties’ interests. I would not wish this concession to be seen as an admission of any anti-competitive effect of the existing procedures, but rather a concession to the fact that agreement is to be preferred over conflict. “Furthermore, having regard to your concerns about the priority given to the licence fee in the selection process, I am prepared to consider an appropriate repositioning of the fee requirement in the selection criteria at paragraph 19 of the competition document. concerned not to limit the flexibility that applicants will have in treating the presentation of their applications. On the other hand, it has been necessary to ensure that sufficient detail will be included to allow an undertaking and an evaluation of the applications one against the other. I believe that the order of priority of the selection criteria elaborated at paragraph 19 of the tender document is a reasonable compromise. I am given to understand that the process I am invoking is in fact one of the most advanced and transparent of its kind in Europe. I have of course recruited international consultants to assist in carrying out the evaluation. I trust the alteration in the positioning of the licence fee criteria will put your mind at rest in this regard. “Although performance guarantees are at the lower end of the selection criteria, this does not imply performance, per se, is a low priority. Firstly there is a mandatory coverage requirement; 90 percent of the population will be reached within four years. Secondly, for any prospective licencee to be selected, in addition to being satisfied that their proposed service is credible, they will have to establish technical competence at all levels of their offer, including their ability to sustain and service their operation. The specific requirements in relation to performance guarantees are purely to elicit, to the maximum extent possible, undertakings in relation to performance which may be imposed as binding licence conditions to guarantee that the offer made is delivered on. “You expressly ask whether Telecom Eireann/Eircell will pay the same amount as the new competitor. I trust the explanation given above will establish in your mind why such a demand of Telecom Eireann is inappropriate, and in truth, will have the effect of imposing on Telecom Eireann an unfair burden, upsetting what would otherwise be a fair competitive climate. Indeed, it is worth repeating that Telecom Eireann/Eircell, the first mover in the GSM market, a relation to network design and implementation and the creation of an awareness among consumers of the benefits of GSM technology. The reality is that Eircell GSM service does not have any major head-start advantage at the time in terms of customers recruited. Rather, the position is that Telecom Eireann has developed the market which is now ready for exploitation. The introduction of a second GSM licence is to ensure that this exploitation occurs in a fully competitive environment. However, it would be quite wrong to fail to recognise the rights of Telecom Eireann/Eircell to be treated equally to the new entrant to the market. “There are also disadvantages for historical reasons which the Telecom Eireann group must overcome. These include in particular the social obligations borne by Telecom Eireann generally to provide a nationwide telecommunications service on a monopoly basis. The company must now overcome the problems arising from its monopoly culture, i.e. severely excessive staffing (as illustrated by customer lines per employee figures) and a heavy debt burden, if it is to meet a new competitive challenge. “I am, as a separate exercise, tackling major problems of Telecom Eireann at present. Officials of DG XIII are broadly aware of our intentions and plans. This is relevant background to what follows in the next paragraph. “You have questioned whether it is intended to allow a direct interconnection between mobile operators. A policy decision has been taken that all international calls must for the time being be switched and delivered via Telecom Eireann. This is considered necessary since international traffic rights cannot in practice be limited to mobile telephony. If the second GSM operator is allowed to interconnect direct with mobile operators abroad, it will be virtually impossible to ensure that connections are not made between a mobile operator here and a fixed operator abroad or vice versa. Our ability to achieve a major turn-around in Telecom Eireann so as to be able to face full liberalisation well ahead of 2003 is critically dependent upon being able to protect certain of its revenue stream in the short term. We intend to fully liberalise the telecommunications market at the earliest realistic date, but like several other Member States, there is a need to pay particular attention to international traffic for a few years. If we conceded the right to switch calls via Northern Ireland at this stage, we would risk seriously undermining our wider and ambitious policy aims. This aspect of the matter is of critical importance in the short term. “I hope you will view this letter as an open and constructive response to the concerns you have expressed. You will appreciate your letter has created a substantial impediment in the way of licensing a second operator in Ireland. The suggestion that the terms of the licence arrangements are in some way anti-competitive could easily translate into an attack on the licensing arrangements by a third party. It is essential to avoid any legal uncertainty which would create difficulties at a later stage. Accordingly, I am anxious that we can record our agreement that the licensing arrangements being operated by Ireland are not subject to complaint by the Commission. In order to allow mutual agreement be reached, I have deferred the closing date for applications to facilitate such agreement. “I have written this letter with a view to securing the earliest possible agreement from the Commission. Delaying will defeat the introduction of competition. CHAIRMAN: Mr. Coughlan, it’s impossible to avoid an occasional error in reading a very long document. I don’t want to be pedantic, but there was just one point about a third of the way into the letter where in fact the word “financial” is followed by the word “might”, and in fact “might” is actually a noun, which slightly alters the sense of it. But that can be put right at lunch time. MR. COUGHLAN: Thank you, Sir. “1. The Commission has provided us with the attached draft response to the Minister’s letter regarding the GSM competition process. It is anticipated that Commissioner van Miert will sign the final version today or early next week. “2. The draft response signifies that the Commission will not pursue infringement procedures if Eircell is obliged to pay a fee similar to the second GSM operator (with the difference being justified by the administrative costs of the GSM competition). Thus a fee of £10 million for Eircell and a voluntary fee subject to a maximum of £15 million for the second GSM operator is acceptable. “3. The Commission reserves the right, however, to re-open the question if there is any departure from the stated competition parameters which places the second operator at a disadvantage vis-a-vis Eircell. “4. The decision not to grant international mobile or mobile direct interconnection is still considered to be contrary to the EU competitive rules. However, in the interest of expediting the grant of the GSM licence, the Commission will not act on this unless a formal complaint is made. This will be a possibility when the second operator is licensed, particularly if Vodafone reenters the competition and wins. Realistically, however, the Commission would have to take similar action against virtually all Member States who have imposed similar restrictions. – Press release by the Minister. “6. The revised competition terms should not be a particular surprise to potential applicants in view of the public statement made by the Minister when the competition was suspended. Contacts for potential applicants suggest that about three weeks would be adequate for revision of bids. Thus, assuming the formal communication is received from the Commissioner on or before Wednesday of next week, that is the 5th July, the new closing date could be set at Friday 28 July. Andersen Management International have indicated that the final evaluation report could be presented by Monday, 16 October. A final Government decision on the new licence should be possible by Tuesday, 28 November. The overall slippage in the competition process therefore would be only four weeks, which is not a significant price for the imprimatur of the Commission. . The draft of the letter furnished by the Commission to the Department was sent to the Department some days later, and I will be coming to deal with that in due course. Mr. Michael Lowry, turning just slightly for a moment, has informed the Tribunal that he attended the Curragh races on the weekend of the Derby in July of 1995. It would appear that the Derby was on the 2nd July, 1995. He has informed the Tribunal that while at the races, some party, whom he can not now recall, approached him and asked him if he would go to see Tony O’Reilly in his executive box. During the course of the afternoon, Mr. Lowry has informed the Tribunal he went to Mr. O’Reilly’s box and a discussion ensued. I should say that in the first instance, Mr. Lowry has informed the Tribunal of something and has subsequently informed the Tribunal of something somewhat different. I will deal with what Mr. Lowry informed the Tribunal of in the first instance. in the country. Mr. Lowry in the first instance informed the Tribunal that Mr. O’Reilly also spoke about recognition of his personal standing as an international business leader. Mr. Lowry informed the Tribunal in the first instance that Mr. O’Reilly stated that he expected his consortium would be successful and that he also demanded that Minister Lowry, as Minister for Communications, should forthwith order and shut down a licence deflector system. The reference to the deflector system relates to a row which was then, or around that period, current regarding television, the provision of television services in a certain area of the country, and pirate operators interfering with State-licensed operators. In the first instance, Mr. Lowry also informed the I will refer to them in due course. The information Mr. Lowry gave to the Tribunal at that time was furnished to Anthony J. F. O’Reilly, and he was asked did he wish to respond to it. Anthony J. F. O’Reilly, in response, informed the Tribunal that he totally rejects Mr. Lowry’s assertion that he made any comment to him concerning the second GSM licence or any application by any consortium for such licence. He has also informed the Tribunal that while he did meet with Mr. Lowry on the weekend of the Derby, he believes, although he is not certain, that the meeting took place on Derby Day 1996, and not Derby Day 1995. Anthony J. F. O’Reilly has informed the Tribunal that in any event, Mr. Lowry has seriously misrepresented what took place at that meeting. Anthony J. F. O’Reilly has informed the Tribunal that he wishes to make it absolutely clear that he never informed Mr. Lowry that he expected his consortium would be successful in relation to its application for the second GSM licence. Anthony J. F. O’Reilly has informed the Tribunal that he believes that the first meeting that he had with Mr. Lowry took place at the opening of the Arcon mine in Galmoy. This took place on the 15th September, 1995. I will refer to that meeting in Galmoy on the 15th September in due course. Anthony J. F. O’Reilly informed the Tribunal that if any meeting had taken place, as Mr. Lowry suggests, during the course of the Derby Week in July 1995, it would have predated the bid by Irish Cellular Telephone in which Independent Newspapers plc and Princes Holdings Limited had an interest, along with several other parties. The bid was submitted on the 4th August 1995, and therefore, as of July 1995, no application had even been submitted to the then Minister by what Mr. O’Reilly would have called “my consortium”. Anthony J. F. O’Reilly has informed the Tribunal that it is absolutely untrue that he had a conversation with Mr. Lowry where he referred to his consortium’s application for the second GSM licence. He has informed the Tribunal that it is absolutely untrue that he stated to Mr. Lowry that he expected that his consortium would be successful. Anthony J. F. O’Reilly’s responses to the Tribunal were furnished to Mr. Michael Lowry, and Mr. Lowry has now informed the Tribunal that he refers to the original statement furnished to the Tribunal, and he refers to the statement of Anthony J. F. O’Reilly to the Tribunal, a copy of which had been provided to his advisers. Mr. Lowry has stated that he believes that his account of events and the date of his meeting with Tony O’Reilly on the weekend of the Derby in July 1995 reflects what transpired at the meeting. I will be returning in due course to other matters relating to a meeting at the opening of the Arcon mine at Galmoy on the 16th September, 1995. “We have reviewed the business plan prepared by Digifone in connection with its application for the second GSM licence and consider its operation of the second GSM cellular system in Ireland to be an attractive and viable project. The application to you by Communicorp sets out how it is intended to inject new equity into Digifone on the licence being granted to it and shows the Advent funds as 5 percent shareholders participating in 20 percent holding which has been allocated to institutional investors. We are delighted to have the opportunity to invest directly in Digifone as well as our indirect investment in the company through Communicorp and Esat Telecom. On the 12th July, 1995, the agreement was signed between Advent International Corporation, Communicorp Group Limited, and Denis O’Brien. “3.1. If Communicorp decides not to participate directly or indirectly in its proportionate entitlement (“Communicorp’s funding entitlement”) to fund Digifone (whether itself and/or through any other member of the Communicorp Group) pursuant to the Shareholders’ Agreement relating to Digifone to be entered into between Communicorp and Telenor (as amended from time to time) or any other agreement or arrangement between those parties supplementing or replacing the same, the Advent funds shall be entitled to provide such proportion of Communicorp’s funding entitlement as is equal to the percentage of the fully diluted share capital of Communicorp held by the Advent funds at that time (the Advent proportion), or in the event that the total funding provided to Digifone by all members of the Communicorp Group at the relevant time is less than Communicorp’s funding entitlement, the Advent proportion of the shortfall. Clause 4.2 of the clause provided “The obligations of Communicorp under clause 3 of this agreement are conditional upon Telenor having been satisfied with the comfort letter issued to it and on the basis thereof having resolved to proceed with its participation in Digifone and the application, provided that Communicorp will use all reasonable endeavours to ensure fulfilment of this condition. MR. COUGHLAN: I was going to now put what they appear to represent, Sir. 1. In consideration of the issue of the comfort letter by Advent International, which was the letter dated 10th July, 1995, to Mr. Martin Brennan, and subject to fulfilling the conditions in Clause 4 of the agreement, Advent would be entitled to receive 5 percent of the fully diluted share capital of Digifone and to subscribe for them, at par or otherwise, on no less favourable terms and conditions than each of the investors specified in the application. 2. Advent had the right to participate in financing raised by Communicorp Group for the purpose of subscription or loan to Digifone. There was an obligation on Communicorp to afford Advent that right in the terms set out in the agreement. There was no obligation on Advent to participate in any such financing. 3. The obligation of Communicorp to afford Advent the right to participate in financing was conditional upon Telenor being satisfied with the comfort letter issued to it by Advent, and on the basis thereof, Telenor having resolved to proceed with its participation in Digifone. Communicorp of course had to use reasonable endeavours to ensure fulfilment of this condition. 4. Communicorp were entitled at any time to waive the condition regarding Telenor being satisfied with the comfort letter issued to it by Advent. I will be coming back to deal with this in due course, Sir, in relation to how matters developed in the course of the application made by the Digifone consortium and how the matter was dealt with in that application and at a subsequent presentation which was made to the project team. MR. COUGHLAN: Sorry, I beg your pardon, Sir… Sorry, I have just been handed a note, and I should say, Sir, that Mr. Michael Lowry contends that his supplemental statement re AJOR did not retract the first statement but merely clarified one aspect; that is, the meaning to be attached to AJOR’s words. That’s correct, Sir. I didn’t say anything else. CHAIRMAN: Right, five to two. Thank you. MR. COUGHLAN: On the 14th July, 1995, the Department sent a letter to each of the applicants extending the deadline for submission of bids to Friday 4th August, 1995, and indicating that the licence fee issue was resolved on the basis of a minimum £5 million with a cap of £15 million and £10 million to be paid by Eircell. I refer to my letter dated 16th June, 1995, concerning the competition for the award of a licence to become the second operator of GSM mobile telephony within Ireland. “The Department’s discussions with the European Commission have now concluded. The Commission is satisfied with the procedure being followed by the Department for the grant of a licence to a second operator of GSM mobile telephony within Ireland. It has been agreed between the Department and the Commission that a cap of IR£15 million be placed on the initial licence fee payable by the applicant. It is also agreed that Eircell be subjected to a once-off fee of IR£10 million to maintain competitive equality. “As a consequence of the above, the original terms of the competition require to be revised. The appropriate amendments to the competition documents are detailed below. – Paragraph 19 of the same document is amended by the substitution of the following words for those in the fourth bullet point. “The amount, in excess of the minimum initial licence fee which the applicant is prepared to pay for the right to the licence”. The information memoranda issued on the 28th April and 12th May 1995 should be interpreted in the light of the amendments to the original competition document as detailed above. .
“I refer to our agreement dated 12th July in regard to the GSM bid to be made by Esat Digifone Limited. “As you are aware, you have written to the Minister of Transport, Energy and Communications and to Telenor Invest AS stating that you have offered Communicorp Group Limited £30 million in respect of their equity participation in the bid. It is possible that this letter was appended to the bid document, but the Tribunal is uncertain as to whether it was ever sent to Advent, as it was not in the documents furnished to the Tribunal by Mr. Owen O’Connell. There is no reference to it in the documents, and there is no reference in any of the Baker McKenzie correspondence on behalf of Advent. On the 14th July, 1995, Mr. Martin Brennan sent a memorandum to the Secretary and enclosed a final version of the letter from Commissioner van Miert. “We receive the signed version of the Van Miert letter (copy attached) which is identical to the draft sent by the Commission last week. “Potential applicants have been notified of the revised terms and the closing date has been set at 4th August. The final decision will still be made before the end November. “As you agreed with Bridget, no press release has been issued. Now, the letter from Commissioner van Miert referred to by Mr. Brennan is stamped dated 14/7/1995. And it seems to be attached to a fax sheet which was Brussels, or it may have been sent to the Irish Permanent Representative in Brussels by Mr. Fintan Towey. “On the basis of the clarifications provided in your letter of 22 June 1995 and during discussions your experts had with DG IV concerning the granting of the second GSM licence in Ireland, the Commission is now in a position to complete its assessment of the auction element in the call for tender of the second operator. Under that is “Mr. Michael Lowry, Minister for Transport, Energy and Communications, 7 Ely Place, Dublin 2, Ireland”. “Moreover, I understand that the fact that the second licence will be granted under Section 111(1) of the Irish Telecommunications Act, which relates to licensing of services within the exclusive privilege of Bord Telecom Eireann, will not limit in any practical way the operations of the licencee, nor preclude the grant of a further licence, once the 1983 Act is revised to take account of Community Law. “In view of these circumstances and assuming these measures are effectively implemented, the Commission deems that the granting procedure followed by the Irish Government does not favour the extension of the current dominant position of its public telecommunications organisation, Bord Telecom Eireann, to the new GSM market, which would constitute an infringement to the Treaty competition rules. “For this reason, the Commission considers that it has no grounds for action under Article 90 (1) in conjunction with Article 86 in respect of the auction fee imposed on the second operator. “This assessment could nevertheless be reconsidered if the factual and legal situation cited above is changed and the competitive situation of the second GSM operator was adversely affected vis-a-vis Bord Telecom Eireann. Eventually most of the contents of this letter was to go into the public domain in one form other another subsequently as determined by the Irish authorities. It did not go into the public domain during the course of the process leading to the award of the second GSM licence; the fact that the Irish Government will give only a limited weighting to the auction element in the call tender less than 15 percent. Now, it is to be noted that that particular document has a date stamp on the top of it, 14/7/1995, and was faxed at 16.18 on the 14th July, 1995. In fact, the fax was 16.18 and 16.19 for the two pages. There is another version of this particular document which appears to be the hard copy which is stamp-dated 14th July, 1995. And it is signed, and it’s in two pages, and it’s stamped “Received” in the Department on the 20th July, 1995. There is a note in the top of that that it is copied to the secretary, Mr. Fitzgerald, Mr. Brennan, and Mr. McCrae, and it looks at the top that it may have been sent to the Attorney General’s office. Prior to the receipt of the fax at 16.18 hours on the 14th July, 1995, there was a letter signed but undated, faxed from the same Commission number, and this appears to have been faxed at 15.57 hours. There is no fax cover sheet. This is two pages. It is signed, but no date stamp on it. On the 22nd June, 1995, which predates this, there was a copy of this letter which appears to have been the draft which had been worked on by Mr. Fintan Towey to which I had referred to earlier – I just have that a bit out of sequence, but there was a draft which had been available to the Department which had been worked on by Mr. Fintan Towey, and it would appear that that arrived in the Department at 20.17 on the 29th June, 1995. From the papers furnished, these appear to be the documents relating to this particular letter on the departmental files, and the Tribunal has been furnished with all documents. made some weeks previously, some many weeks previously, for access to the documents which may have been in the possession of British Telecom and related to any papers which may have been kept by a Mr. Jarleth Burke, who is a lawyer, an Irishman, a lawyer practicing in Brussels and who, at the time that this correspondence between the Minister and the European Commissioner was taking place, had the title of Chief Regulatory Counsel for Esat Telecom. As the Tribunal considered these documents last Friday, it was noted that there was a fax sheet dated the 27th July, 1995 – sorry, I beg your pardon, 24th July; it’s an Esat Telecom facsimile sheet. It’s to a Mike Kedar, who was a director of Esat Telecom. It’s dated 24th July, 1995, and the fax number is given; it’s a United States number. And it’s from Jarleth M. Burke, and it’s re, “See attached”. “2. Commissioner van Miert’s letter to the Minister on GSM. In the order which these documents came to the Tribunal from British Telecom, what was attached to this fax sheet at Item Number 2, Commissioner van Miert’s letter to Minister on GSM, was the front, or first page of Commissioner van Miert’s letter to the Minister. The Tribunal checked with Messrs. McCann Fitzgerald Solicitors to see if there was the second page of this particular document in the papers, and the Tribunal has been informed that there was not. This first page contains information relating to the Irish second GSM competition process, and in particular, information concerning the weighting which might be attached to the tender, to the auction element, and is the front page of the letter which I have just read out. “I refer to recent correspondence. I now wish to draw to your attention the following four documents from your files at BT/ESAT. “1. Fax cover page from you to Mike Kedar, 24th July, 1995. “2. A business card of Michael H. Ryan of Coudert Brothers, Solicitors. “3. The front page of a two-page letter, undated, from Commissioner van Miert to Mr. Michael Lowry. “4. A draft letter of the 23rd July, 1995, from you to Mr. Sean McMahon. – 3. What was the purpose of sending the document to Mr. Mike Kedar. “While the Tribunal in due course will be in touch with you with a view to obtaining your responses to a number of other queries, I am writing at this point to request a response to these queries at the very earliest opportunity, and if at all possible by return, as the Tribunal will wish to refer to these matters in the course of its Opening Statement commencing on Tuesday, 3rd December, 1995, and it will be extremely valuable to have your response above in advance of any references to the document in public. On the 2nd December, 2002, Mr. Davis received this response from Mr. Jarleth Burke. “1. I do not have access to my files, and therefore, I cannot specifically recall from whom I received the letter other than to suggest that in all likelihood it came from the European Commission. It is also likely that it was faxed to me. “2. I do not have my files, so I cannot confirm the date on which I received it, but I expect that it was within a few days of it being signed. Mr. Davis responded on the 2nd December, 2002. “Thank you for your prompt response of my query of today’s date. I should have indicated that the top of the document as furnished to the Tribunal, and from inquiries made of British Telecom’s solicitors, the original copy document on the files of Mr. Jarleth Burke obscure the top of the first page of Mr. Karel van Miert’s letter, and it is not possible to ascertain the section of the Commission from which it came or the date or time on which it came. documentation was found on your files could lead to the making of negative findings which might impact on you personally and/or on Esat Telecom and/or on the Esat Digifone consortium. “I would be much obliged for any comments you have to make, and in particular, any comment you think should be included as part of the Tribunal’s Opening Statement concerning the fact that this document was on the Esat Telecom files under your control. Any such comment will be considered for inclusion in the Opening Statement. I would be very much obliged for a response at your earliest convenience. “I refer to your letter of the 2nd December, 2002, and to our conversation of last night. “In your letter you mention that the Tribunal is under a duty to investigate how the document came into ESAT’s possession. However, I disagree with your view that the fact that this document was in ESAT Telecom’s possession may give rise to a negative finding which may impact on me personally, or indeed on ESAT Telecom or the ESAT Digifone consortium. “As I indicated to you last night, and which you readily indicated (based on the information before you) there is no suggestion that I did anything improper so as to obtain this document. On that point, let me be categoric, I did not take this document from somebody’s file, or otherwise do anything improper leading to it being sent to ESAT Telecom. “I also note that you refer to the letter as being ‘confidential information concerning the evaluation process’. This is misleading. The letter refers to the European Commission’s intervention in the process in relation to the EU law. For example, it does not specify the weighting to be attributed to the fee, which in any event we knew would be limited because of the Commission’s policy of disfavouring auctions. “Based on what I have indicated to you, namely that in all likelihood the document came from the European Commission, it falls to the Commission to either confirm or deny that it did come from it. As such, the disclosure of this letter to Esat Telecom is a matter for the Commission. “I also note your invitation to make comment in relation to the Tribunal’s Opening Statement in this regard, I suggest that the Tribunal clearly indicate the issue of how and whether ESAT should have obtained this document is, as first instance, a matter for the European Commission and that the issue of whether the letter is in fact ‘confidential information concerning the evaluation process’ is in dispute. “You have indicated that you will send me a large number of files which I previously had in ESAT. In terms of the source of the Commission letter, I am quite happy to go through these files, which may result in me locating information indicating its precise origins. I trust that I will have a reasonable amount of time to do that. You should also note that any information that I have furnished to date in good faith may need to be changed, amended or otherwise changed as to substance, context, content, date, etc., as more documents are provided to me. In this regard, I welcome your intention not to continue to send me information on a piecemeal basis. “As I indicated to you last night, I continue to represent myself legally in this matter, and so far I have not retained solicitors. Further to the last letter from you, which dealt with the issue of costs” – this deals with some other matters which the Commission had been in contact with Mr. Burke about. CHAIRMAN: Well, the Tribunal have been in contact with Mr. Burke about the Commission. 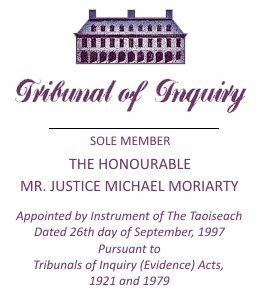 Now, Sir, what the Tribunal is endeavouring to ascertain is how Mr. Burke and/or Esat/Telecom came to be in possession of this document, which was not addressed to either Mr. Burke and as far as the Tribunal is concerned appears to be part of a confidential correspondence between Commissioner van Miert and Minister Michael Lowry. The Tribunal takes the view that this letter represents an important part of the EU intervention in the process up to that point and set out the basis upon which the EU was prepared to countenance a revision or arrangement for the conduct of the process in Ireland. The letter from Commissioner van Miert did not specify the precise weighting to be attributed to the fee. It did, however, indicate that the weighting to be attributed to the fee would not exceed 15 percent. This of course provided anyone with access to the letter with information as to a range of weightings that might be attributed to the fee, and in addition, valuable information as to the range of weightings which might apply to other criteria which were specified by the State in descending order of priority. The Tribunal will inquire into this matter for the purpose of ascertaining whether the integrity of the process was compromised. MR. McGONIGAL: Mr. Chairman, just before Mr. Coughlan continues, in view of Mr. Burke’s letter, can I inquire of Mr. Coughlan at this stage whether he has taken advantage of Mr. Burke’s suggestion and contacted the European Commission in relation to the origins of this letter, and does he want to open that correspondence as well? MR. COUGHLAN: I was about to say, Sir, before Mr. McGonigal interrupted my Opening Statement, that since this particular correspondence was received from Mr. Burke, the Tribunal has written to the Commission and has as yet received no response. “The new revised weightings as agreed in recent telephone conversations with Project Group Members and as later confirmed in written communications received from each interest represented on the group are as follows.” And it contains the weightings. Moving to another matter at this stage, there is a minute of a meeting held on Friday 21 July, 1995, of the committee for the Fine Gael Golf Classic, 1995. It records that Denis O’Brien, Esat Telecom, is identified as a potential sponsor and assigned to Mr. Phil Hogan. Present at the meeting were: Mr. David Austin, Mr. Enda Marron, the late Mr. Sean Murray, Mr. Jim Miley, Mr. Mark FitzGerald, Mr. Frank Conroy, Mr. Phil Hogan TD, Owen Killian. Apologies were from John Quirke, Pat Dineen, and Pat Heneghan. On the 27th July, 1995, there is a note in the departmental files by Maev Nic Lochlainn which deals with revised weightings. On the 31st July, 1995, the Department wrote to all applicants requesting clearance to publish the names of applicants and the identity of member of consortia. On the 31st July 1995, Mr. Peter O’Donoghue sent a fax to Mr. Knut Haga of Telenor confirming that Advent and Communicorp had entered into an agreement whereby Advent had committed up to £30 million in the event that Esat was successful in its bid. “Further to our conversation today I confirm that Advent International Corporation and Communicorp Group Ltd have formally entered an agreement whereby Advent have committed up to IR£30 million to the Communicorp Group in the event that Esat Digifone is successful in its bid for the second GSM licence in Ireland. In consideration of Advent making these funds available, Communicorp has agreed that Advent will be entitled to participate in up to 5% of the equity capital of Digifone limited. Denis O’Brien is also a signatory to this agreement. “Accordingly, as the above parties represent 100% of the shareholders of the Communicorp Group, they have given their consent to the increase of capital required in Communicorp to facilitate the investment in Esat Digifone. It would appear that the contents of this memorandum are at variance with the agreement dated 12th July, 1995. “With reference to Joint venture agreement dialogue with Peter O’Donoghue and facsimile letter from Peter, 31st July (enclosure) I would like to express my concern related to the issue of ‘financial guarantees’. “Based on the letter from Peter, I required a similar statement from Advent International through Baker & McKenzie. Ms. Helen L. Stroud called this afternoon and told me that there were not made any agreements between Advent and Communicorp related to the said £30 million IEP. “If this information is correct I believe we may have serious problem related to establishing an acceptable level of financial comfort. “1. That the forwarded financial information (enclosure to your letter dated 13 July) related to various funds as of the 31.12.94 is correct – please make reference to each specific fund. “2. That no material changes have occurred since 31.12.94. – please make references to each specific fund. “3. That an agreement between Advent (AIC) and the Communicorp Group has been signed and that the agreement is related to an equity increase in Communicorp due to the award of a GSM 2 licence in Ireland to Digifone. Opposite paragraph number 3, the word “No” is written with an arrow pointing to it. We have asked the firm of William Fry Solicitors, as this document was furnished to the Tribunal from that source, as to who made this annotation, and when. “Telenor have requested us to provide them with a slightly reworded Financial Guarantee from yourselves. I attach the requested wording. I do not believe the attached is any more onerous than what I had previously provided us with and I would be grateful if you could prepare a letter addressed to Telenor along the lines of the attached. “As you are aware, the bid is due for submission tomorrow, the 4th August, and we would require the letter today. Mr. Peter O’Donoghue has informed the Tribunal that he had a telephone conversation with Mr. Massimo Prelz on the 3rd August, 1995, and that he made a handwritten note of the conversation. On the 4th August, Esat Digifone sent a letter to Mr. Fintan Towey confirming the name of the consortium and informed Mr. Towey that the consortium was made up of Communicorp, Telenor, and institutional investors. The letter informed Mr. Towey that they did not wish the names of institutional investors to be released at any stage. This was in response to a previous communication from the Department which inquired as to whether the names of the members of the consortium could be published. The 4th August, 1995, was the closing date for submission of application. The Department received six applications plus a preliminary GSM business case description from Eircell. This had been requested for comparative purposes. Subsequently, the Department and Eircell agreed that the description which Eircell submitted was insufficient, and on the 11th August, a more detailed submission was received. “Advent International plc, on behalf of its funds under management, confirms that it has offered IR£30 million (thirty million Irish pounds) to Communicorp Group Limited for the necessary equity increase in Communicorp Group Limited to establish and operate a GSM network in Ireland. “We wish to confirm that we have received an offer from Advent International Corporation Limited of funds sufficient to perform our obligations in respect of the Bid. We wish, however, to seek alternative sources of funds because the terms of Advent’s offer are unfavourable to us. On the 4th August, Mr. Gerry Halpenny, a solicitor in the firm of Messrs. William Fry, records a telephone conversation with Mr. Bugge in the following terms. “Opinion re Advent offer to be provided. “Ask Denis O’Brien for Advent offer agreement that is legally binding on Advent. On the 4th August, 1995, Messrs. William Fry wrote to Communicorp Group Limited as follows, under the heading “GSM bid”. “I enclose for your attention a copy of the letter handed over to Armund Bugge today in connection with the financing of the GSM bid. “We also discussed at our meeting this morning what steps should be taken with Advent regarding the funding of the GSM company. As you will recall, Owen O’Connell is strongly of the view that the condition in Clause 4.2 of the agreement dated 12 July, 1995, has not in fact been satisfied and that you should very strongly consider sending a letter along these lines to Advent stating as that agreement was not satisfied, the Agreement 12 July, 1995, is of no further effect. “I trust this is in order. “Confirmation letters from all equity partners are contained in the Financial Appendix. “The maximum equity requirement will be £52 million. The business plan envisages that £26 million will be invested upon award of the licence to fund the up-front licence fee and to cover initial capital investment in operating costs. A further £26 million will be injected in 1996, when the first debt finance will also be drawn down. The £26 million in 1996 contains £4 million for performance guarantee penalties. “The Shareholders’ Agreement states that Communicorp and Telenor will each initially hold 50% of the equity of Esat Digifone. In the period leading up to the award of the licence, 20 percent of the equity (10 percent from each of the partners) will be formally placed by Davy Stockbrokers, Ireland’s largest stockbroker. Standard Life of Ireland to make an equity investment of 2.5 million pounds (4.81 percent of the total equity. – Advent International plc, to make an investment of at least 5 percent of the total equity. “This payment of share capital will be activated immediately after award of the licence (letters of commitment are presented in Financial Appendix C). “The consortium partners have sufficient financial capacity to meet and exceed all their financial commitments to the company, as demonstrated below and supported by the audited financial statements contained in Management Appendices B and C and letters of commitment contained in Financial Appendix C.
“Communicorp Group is a young, high-growth company in the broadcasting and telecommunications industries. Its operating revenues are forecast to grow from IR£12 million in 1995 to over IR£260 million by 2000, at which time the net earnings before tax is forecast to be IR£19.1 million for the year. Communicorp has strong financial backing from Advent International, one of the leading international development capital investors in telecommunications, media, and information technology industries. In addition to its current investment of £12 million in Communicorp, Advent has offered up to a further £30 million to fund Communicorp’s equity participation in Esat Digifone. The sum exceeds Communicorp’s share of the licence fee and equity commitment. On the 9th August, 1995, Andersen Management International sent a reader’s guide to members of the Project Group reading the applications. I don’t think I need to go into that in any detail at this stage, Sir. Mr. Dermot Desmond has informed the Tribunal that Denis O’Brien and he attended a football match on the 10th August, 1995. At that match, there was a discussion on Mr. O’Brien’s progress with the bid for the second mobile licence. According to Mr. Desmond, Mr. O’Brien indicated that they had made a very good presentation and had a good team in place, but they were uncomfortable on the funding side. They had no binding commitment from the financial institutions, no indication on pricing, and no willingness from the financial institutions to bear any of the costs if the bid was not successful. Mr. Desmond has informed the Tribunal that he offered to invest in Esat Digifone on the same basis that Telenor were investing, to meet Mr. O’Brien’s proportional share of the bid costs and to underwrite Mr. O’Brien’s share of the investment. Mr. Desmond has informed the Tribunal that following negotiations, an agreement was reached on the 29th September, 1995. I will refer to this agreement in due course. Mr. Desmond has informed the Tribunal that no discussions or dealings took place prior to the 4th August, 1995, in relation to the GSM business. Mr. O’Brien has informed the Tribunal that he had asked Mr. Kyran McLaughlin of Davy Stockbrokers to help him place 20 percent of the equity in Esat Digifone with a number of institutions. Advent’s 5 percent was included in this 20 percent. According to Mr. O’Brien, Mr. McLaughlin approached institutional clients of Davys, but ultimately the letter of interest received from the institutions did not show an irrevocable commitment to proceed with the investment should Esat Digifone be successful in its licence bid. He (Mr. O’Brien) has informed the Tribunal that he decided to source some other institution to underwrite this institutional 20 percent block of equity to demonstrate that all of the equity funding was pre-committed. As far as he can recall, he spoke to Credit Suisse First Boston, but because of the tight time-frame, it was going to be impossible to put an underwriting agreement in place in time. He has also informed the Tribunal that in June, 1995, Communicorp was short of the cash and needed to raise approximately £5 million. Mr. O’Brien has informed the Tribunal that Dermot Desmond had been approached by Mr. O’Brien on behalf of Communicorp Group but that Communicorp were unable to agree terms. A $5 million loan was subsequently obtained from Advent at an interest rate of 30 percent. Mr. Denis O’Brien’s diary for the 11th August 1995 has an entry, “3pm, Dermot Desmond at IFSC”. Sorry, I just looked up at the monitor. It is there; it’s just that the highlighting of it means it doesn’t seem to come up in the imaging. “The conversation ended rather inconclusively with me agreeing to discuss the matter further with you and to contact him next week. It accordingly seems that we will have to resolve the matter in some way, and presumably we can decide on how to do so at our meeting on Monday at 3pm. “Re Outline Agreement on £3,000,000 Guarantee for Communicorp Group Limited. “Communicorp Group Limited will arrange for Dermot Desmond (‘DD’) to have a right to take up at par 15% of the ordinary shares in Esat Digifone Limited replacing IBI, AIB, and Standard Chartered. “A total of £1.3m-£1.5m will have been expended on the bid by award of licence. It is agreed that DD will pay this portion of costs, win or lose. “DD will provide a bank guarantee of £3,000,000 in order for CGL to draw down £3,000,000 bank facility which will remain in place up to March 31, 1996. “In exchange for this guarantee DD will be paid a fee of £300,000 no later than March 31, 1996. Should CGL complete its placing of equity through CS First Boston before March 31, 1996, the fee will be paid within 10 days after completion of the placing. “If the £3,000,000 facility including interest is not repaid by March 31, 1996, DD will have a right to purchase 33.3% of Radio 2000 Limited (Classic Hits 98FM) for £1. CGL currently holds 76% of Radio 2000 Limited. It would appear that no agreement was reached by Denis O’Brien and Dermot Desmond on these terms. On the 16th August, 1995, Mr. Michael Lowry had a meeting at Killiney Castle Hotel with Mr. Tony Boyle and Mr. Frank Conroy. I have already made reference to Mr. Tony Boyle, who was Chairman of the Persona consortium. This meeting had been arranged by Mr. Frank Conroy. Mr. Tony Boyle has informed the Tribunal that as the Chairman of Persona Digital Telephony Limited, he led the team that prepared and submitted the bid for the second GSM mobile licence. In connection with this responsibility, he undertook an intensive lobbying campaign with various interested parties, including the media, political leaders of all parties, representative bodies, etc. The purpose of this campaign was to explain to all interested parties the strength of their bid and the credentials of their partners. The insurance brokers to the Sigma Group were Barrett Hegarty Moloney Limited, Kildress House, Pembroke Road, Dublin 4, who, according to Mr. Boyle, were known to have a strong relationship with Fine Gael. The main contact in Barrett Hegarty Moloney was Mr. Colm Moloney, Chief Executive Officer, who introduced Mr. Boyle to the chairman at the time, Mr. Frank Conroy. Mr. Conroy offered to request Michael Lowry to meet with Mr. Boyle so that he could make a representation to him. Subsequently a meeting was arranged with Mr. Lowry and Mr. Conroy in the Fitzpatrick Castle Hotel in Killiney, County Dublin. Mr. Boyle’s diary indicates that this meeting was arranged for 6 p.m. on the 16th August, 1995. Bids had already been submitted by this stage. Mr. Boyle has a general recollection that this meeting may have been rescheduled but cannot find any note to that effect in his diary. Anyway, there or thereabouts, on the 16th August, 1995, the meeting took place with Mr. Lowry and Mr. Conroy in the public bar of the Fitzpatrick Castle Hotel. Mr. Conroy introduced Mr. Boyle to Mr. Lowry and then attended the meeting, which lasted approximately 30 minutes, according to Mr. Boyle. Mr. Boyle introduced himself and explained that the purpose was that the Minister heard directly of their interest in the bid and the strength of their team. They had prepared publicity material which was to be shared with each member of the Oireachtas, and with the various interested parties, which outlined the key elements of their bid. Among other things, it identified the members of their consortium and their credentials, their approach to marketing, their environmental approach, their proposed tariffing philosophy, their stated presentation for early launch, their funding, and various other items of information on their bid. Mr. Boyle has informed the Tribunal that Mr. Lowry listened intently to their proposals and said that he was aware that their consortium was a very strong contender. Upon conclusion of the meeting, Mr. Boyle reported to his board that he had the opportunity to put a positive presentation to the Minister on the credentials of their proposal. Mr. Boyle does not recollect any other meeting with Mr. Lowry except perhaps by a casual introduction at a social event. From what the Tribunal has been informed, there was no official present at this meeting, and there is no record of this meeting in any official documentation or sources. Mr. Michael Lowry has informed the Tribunal that he can recall having a short meeting at Fitzpatrick’s Hotel, Killiney, sometime after the competition was announced. The meeting was, he recalls, organised at the request of Mr. Boyle through Mr. Frank Conroy. In response to Mr. Boyle’s general queries, Mr. Lowry has informed the Tribunal that he informed Mr. Boyle that the object of the exercise was to bring competition to mobile communications with reduced call charges and handset costs to the customer. Mr. Boyle gave Mr. Lowry some outline of what he anticipated that his consortium call charges might be, and Mr. Lowry recalls Mr. Boyle indicated that his consortium charges were very competitive relative to then Telecom Eireann charges. For some ten years Mr. Conroy was non-executive chairman of an insurance brokerage firm called Barrett, Hegarty Moloney Limited. Mr. Moloney would have been aware of Mr. Conroy’s involvement with the Fine Gael Party and also aware of the fact that Mr. Conroy knew Minister Lowry. At some point, Mr. Moloney asked Mr. Conroy if he would arrange a meeting between the Minister and Mr. Tony Boyle, who was a senior executive director in the firm Motorola Limited, who Mr. Conroy believes were amongst those bidding for the new telecommunications licence. Mr. Moloney would have explained to Mr. Conroy that the broke an of which Mr. Conroy of Chairman did a great deal of work for Motorola, and it was in this context that he approached him. Mr. Conroy approached Minister Lowry and asked if he would be willing to meet with Mr. Boyle, indicating the circumstances. Mr. Lowry indicated his willingness to meet with Mr. Boyle, and the meeting took place at a time when the Dail was not sitting, and the Minister, who was then in town on business, was staying as Mr. Conroy’s guest at his home in a penthouse adjacent to the Killiney Castle Hotel. On the day of the meeting, Mr. Conroy took the Minister over to the hotel, introduced him to Mr. Boyle, and left them. To the best of Mr. Conroy’s recollection, he would have adjourned to the bar, where he would have had some refreshments. Again to the best of Mr. Conroy’s recollection, the meeting lasted for something in the order of between 15 and 20 minutes. Mr. Conroy has informed the Tribunal that he did not participate in the meeting in any manner. Mr. Conroy has informed the Tribunal that he has no knowledge whatsoever of what transpired between the then Minister and Mr. Boyle, although he was of course aware of the purpose of the meeting, which he understood to be a lobbying exercise on the part of Mr. Boyle on behalf of the company of which he was a senior executive. At the conclusion of the meeting, it is Mr. Conroy’s recollection that the Minister and Mr. Boyle shook hands and Mr. Boyle left. The Minister and Mr. Conroy returned to Mr. Conroy’s apartment, and to the best of Mr. Conroy’s recollection, the Minister stayed overnight and left on the following morning. The Tribunal will inquire into all circumstances of this meeting in the context of the protocol for confidentiality agreed by the Project Group, the advice given by the Secretary of the Department to the Minister about contacts with members of declared consortia, and the acceptance at all times by the Minister of the advice given by the Secretary. On the 17th August, 1995, the Department sent a letter to Esat Digifone Limited indicating their intention to hold their presentation on Tuesday, 12th September, at 2.30pm. The Department also enclosed a list of questions which required a written response. “I refer to your meetings with Gerry Halpenny and myself during the week ended 4 August, and to our telephone conversation of 11 August. I confirm that following our telephone conversation I discussed outstanding issues with Denis O’Brien. “We are aware that the issue of most concern to you is the ability of Communicorp Group to fund its share of the capital amounts needed in the event that ESAT Digifone is granted the second GSM licence for Ireland. I just pause there; the opinion which Mr. O’Connell was not in a position to provide was an opinion as to the enforceability of Advent’s offer. “As we have explained to you, Communicorp Group does not wish to take up the Advent offer, mainly because it is on very disadvantageous terms. A number of other funding avenues are being pursued, and it is hoped that these will prove fruitful very quickly. In particular, a US equity and debt placing by Credit Suisse First Boston is at an advanced stage and is designed to provide ample funds for Communicorp’s present and planned projects including GSM. Indeed, Credit Suisse First Boston have shown particular interest in the GSM project. Communicorp does not wish to enter into discussions with Advent in order to have a letter provided to you in terms stronger than the letter of comfort which you already have. This is due to the delicate nature of the commercial and political relations between Communicorp and Advent; in essence, while Communicorp could very likely obtain a letter for you from Advent which would be in stronger terms than the existing letter of comfort, the indirect commercial cost to Communicorp as regards other discussions which are underway with Advent and other parties would be very high. “To date, approximately IR£1 million has been expended on the GSM project, of which Telenor has met only IR£200,000 of its committed £400,000 despite having equal participation. I feel that Communicorp’s commitment and its intention of providing further funds are amply demonstrated by its expenditure to date. In effect, Telenor has had a substantial carried interest in the project. “When the GSM licence is awarded, it will either be given to ESAT Digifone or it will not. If it is not, then no further funding requirements will ever arise, and the question of ESAT’s ability to fund its obligations would be academic. Conversely, if (as everyone hopes) the second GSM licence is awarded to ESAT Digifone, then significant funding requirements will quickly arise both as regards Communicorp and as regards Telenor. In this situation, either Communicorp will perform its obligations, i.e. provide cash, or it will not. When Communicorp provides the necessary funds, then the question of intervening guarantees, letters of comfort, commitments, legal opinions, offer letters, and all other such documents will be superseded and will be irrelevant – because the cash will be in place. It is only in a situation where Esat Digifone is awarded the licence and Communicorp does not provide its share of the necessary funds that there is any situation to be addressed. “Although Communicorp is confident of its ability to provide funds, we have analysed Telenor’s position in the unlikely event that funds are not forthcoming. It seems to us that Telenor has two alternatives, neither of which should cause it any difficulty nor result in it expending any money in excess of that for which it has provided. The first alternative is simply for Telenor to inform the Irish Government, with regret, that its Irish partner (Communicorp) did not meet its financial obligations and Telenor has accordingly been obliged to withdraw. In such a situation the Irish Government will presumably award the licence to the second-ranked applicant, and matters would go on from there without the involvement of either Communicorp or Telenor. We do not believe that any blame would or could attach to Telenor in a situation where its Irish partner had defaulted, and we do not think that there is any reason for Telenor being reluctant to withdraw from the bid in such situation. The second alternative is for Telenor to seek a new partner or partners to replace Communicorp. In this situation, Telenor would already have a long list of potential partners (being all the members of the losing consortia) who would be free to participate by virtue of the award of the second licence to Esat Digifone and who have already demonstrated their desire to invest in the second GSM licence by joining their very many of these consortium members – both Irish and international – have abundant resources and would be able to replace Communicorp immediately and to any extent wished by Telenor. “1. You have been provided with assurances by Communicorp and Advent as to the availability of funds, as well as to an undertaking by Communicorp to take them up and an indication of the main alternative source (i.e. Credit Suisse First Boston, by a placing). “2. Even if the licence is awarded to Esat Digifone and Communicorp does not provide its funding (the latter being a very unlikely circumstance for the reasons stated in 1 above), Telenor will not be at any loss nor placed at any material disadvantage; indeed, it will benefit from the £800,000 already spent by Communicorp. “3. Telenor, even in the worst csae, will have the ability to proceed with the project, probably on better terms than those negotiated with Communicorp because it will be offering participation in a successful consortium. “Communicorp is satisfied that it has provided adequate assurances to Telenor in respect of its final obligations, present and future. It has done so by the letters and undertaking already given to you, through its payment of the bulk of expenditure to date, and as evidenced by the efforts and commitment of Mr. O’Brien, its senior management, and staff. We feel that continued insistence by Telenor on financial everyone concerned of damaging our joint bid, and we would ask you to accept the letter of comfort which Advent has already provided and the letter of undertaking which Communicorp has given to you in relation to it and not to seek any further legally binding or other commitment or opinion from Communicorp or from us pending the award of the licence. We accept of course that if you do not respond favourably to this appeal, it will be necessary for us to meet with you and your client in an attempt to resolve the impasse. This we will be very happy to do either in Dublin or in Oslo. “As a related matter, we are both aware that there are a number of other issues outstanding between Communicorp and Telenor before the Shareholders’ Agreement can be signed. The most important of these are additional shareholders (in clause 5) and transfers of shares (in clauses 13 and 14). Presumably you will also wish to review the draft articles of association which we have provided and may have comments on them. It is in the interest of all parties to conclude the Shareholders’ Agreement as soon as possible and I suggest these issues be handled as soon as possible – either as the major outstanding issues if you accept our position on the funding question or if you do not, in conjunction with the resolution of the funding questions. “Perhaps when have you reviewed this letter and discussed it with your clients, you would revert to me with a response and perhaps to make arrangements for a meeting between us. On the 29th August, 1995, there was a meeting between departmental officials and officials from the Attorney General’s Office to discuss the mechanics of the licence. I need to get a document to hand, Mr. Davis has just gone to get it, before I proceed, Sir. I wonder, would you give me – sorry, I can – there doesn’t seem to be any great necessity to deal with it. I wonder, would you just give me two minutes, and I’ll just get myself organised. MR. COUGHLAN: Mr. Mark FitzGerald has informed the Tribunal that he was a member of the Organising Committee for the Fine Gael Golf Classic which was held at the K-Club on the 16th October, 1995. He has informed the Tribunal that sometime in August, 1995, Mr. O’Brien telephoned him at his then office at Merrion Row and asked to meet him for a cup of coffee in the Shelbourne Hotel. At that time Mr. FitzGerald and Mr. Denis O’Brien knew one another, although they were not particularly friendly. Mr. FitzGerald has informed the Tribunal that he may previously have had some earlier business contacts with Mr. O’Brien. When he received the phone call, Mr. FitzGerald assumed that Mr. O’Brien wanted to discuss some business matter. According to Mr. FitzGerald, Mr. O’Brien told him that he was applying for the second mobile telephone licence and that he was facing an uphill struggle against Motorola, and there were rumours that Mr. Albert Reynolds was in line for a payoff if Motorola was granted the licence. Now, Mr. FitzGerald has informed the Tribunal that there was no discussion as to whether this rumour was in any way credit worthy. I want to pause there for a moment, Sir, and stress that the Tribunal has no basis whatsoever for thinking that Mr. Reynolds behaved in any way inappropriately. CHAIRMAN: Well, it is important that that be stressed, Mr. Coughlan, because obviously Mr. Reynolds isn’t present. MR. COUGHLAN: The Tribunal’s interest in this particular statement, if it was made, solely relates to the fact that similar statements were made on two subsequent occasions and are attributed to Mr. Michael Lowry. One of those occasions was at the end of October of 1995, and I will deal with that in due course. The Tribunal wrote to Mr. Lowry about that statement in the Dail and asked him the identity of the senior member of the previous Government referred to in the course of the statement, together with a narrative statement of Mr. Lowry’s knowledge of the alleged agreement mentioned. Mr. Davis also asked Mr. Lowry’s solicitor to let him have the name of the major player referred to by Mr. Lowry in that statement in the Dail. According to Mr. FitzGerald, Mr. O’Brien told Mr. FitzGerald that he, Mr. O’Brien, wanted to keep up his profile with Fine Gael and that he had heard that Fine Gael were having a golf outing. Mr. FitzGerald has informed the Tribunal that he told Mr. O’Brien that he thought it might be unwise for him to be involved in the event in the circumstances in which he was applying for the licence. But he told Mr. O’Brien that Mr. David Austin was running the Golf event if Mr. O’Brien really wanted to become involved. Mr. FitzGerald has informed the Tribunal that shortly afterwards he spoke to Mr. Jim Miley, the then General Secretary of Fine Gael, and told him that he had been approached by Mr. O’Brien and that he did not think that Fine Gael should accept a corporate donation from him. Mr. FitzGerald was aware that Mr. O’Brien had previously supported other Fine Gael functions. Now, in relation to this particular event, Mr. O’Brien has informed the Tribunal that with reference to information regarding meetings or conversations that allegedly took place with Mr. Mark FitzGerald, Mr. O’Brien acknowledges that Mr. FitzGerald is an acquaintance of his, and indeed that his firm would have acted for Esat and Mr. O’Brien on a number of occasions in connection with property transactions in his capacity as Chief Executive of the Sherry FitzGerald group. However, although Mr. O’Brien may have spoken to Mr. FitzGerald on a number of occasions during 1995, Mr. O’Brien’s recollections differ significantly to those of Mr. FitzGerald. In particular, Mr. O’Brien has no recollection of ever speaking to Mr. FitzGerald in reference to Mr. Albert Reynolds or the Motorola consortium. Mr. FitzGerald has informed the Tribunal that at a subsequent meeting of the organising committee of the Golf Classic, which appears to have taken place on the 6th September, 1995, Mr. David Austin thanked him for the introduction of Mr. O’Brien, whose company Esat were offering to assist in sponsoring the event. Mr. FitzGerald has informed the Tribunal that he was a little uncomfortable about the sponsorship, but having already spoken to Mr. Miley, did not think it necessary to involve the fundraising committee in the question. Mr. Jim Miley has informed the Tribunal that he became General Secretary of the Fine Gael Party in 1995. He has no specific recollection of the committee meeting for the Golf Classic which took place on the 21st July, 1995, and which assigned to Mr. Phil Hogan the task of following up Mr. O’Brien/Esat Telecom. He did not recall Mr. Mark FitzGerald on any occasion raising the issue of a proposed donation/sponsorship for the 1995 Golf Classic from Mr. O’Brien or Esat. He has no recollection of Mr. FitzGerald discussing the appropriateness or otherwise of such a donation. He had a general recollection of Mr. FitzGerald being a strong advocate of the need to ensure that the highest possible standards of ethics and propriety be observed in relation to fundraising, and that he strove at all times to maintain those standards to the full. On the 30th August, 1995, a letter was sent under the name of Mr. Phil Hogan to Mr. Denis O’Brien indicating that he was pleased to hear of Mr. O’Brien’s sponsorship of the Golf Classic. The sponsorship was to be £4,000, that is £1,000 for a hole and £3,000 for the wine at the dinner. Ms. Deirdre Fennell, who worked in the Fine Gael office at the time, has informed the Tribunal that she thinks that the letter was dictated by Mr. David Austin. CHAIRMAN: I wonder, Mr. Coughlan; it’s nearly four o’clock. You are moving into somewhat different terrain, and it probably is preferable that matters be resumed in the morrow. It does occur to me, Mr. Coughlan, that obviously at the conclusion of your lengthy opening you will no doubt be observing and I will probably be reinforcing the fact that of course, as in previous lengthy openings, what is being put before the public and persons reporting the event are merely matters that will be duly addressed in evidence and relate to the lengthy private investigation that the Tribunal has pursued, and no doubt the members of the media, in their proper professional manner, in the normal way, will bear that in mind in regard to all matters including the aspect that was recently touched upon and the specific context and reservations that you expressed in relation to it. MR. COUGHLAN: That is so, Sir. CHAIRMAN: Eleven o’clock tomorrow. Thank you.